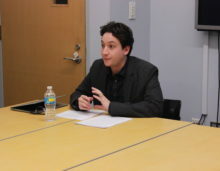 On December 7, 2016, the Jordan Center for the Advanced Study of Russia at NYU welcomed Samuel Casper for a colloquium on his working paper entitled, “‘Help Me to Learn the Truth – Where is Betal and is He Alive?’: Patronage Ties and the Genesis of Posthumous Rehabilitation in the USSR.” Director Joshua Tucker introduced Casper, who is a Ph.D. candidate in the Department of History at the University of Pennsylvania and a writer-in-residence at the Jordan Center. Casper began with an introduction to his paper, which he said seeks to expose “how these previously dormant patron relationships express themselves after all the destructions and the upheavals of the [Great] Terror,” and how different ties extended between the state and the Soviet elite during this time. “Instead of presenting the government in the form of faceless or nameless bureaucrats, my approach is to look at the state being embodied or at least represented […] by an individual with whom these families had had a lot of close contact and actually very close and meaningful ties: the elite Soviet politician Anastas Mikoyan.” Casper added that one of his larger objectives for the project as a whole is “to challenge the centrality as Khrushchev as an individual and the Secret Speech as specific event” in how the Thaw played out. Casper said he was surprised by the level of ignorance among survivors about what actually happened to their own family members. Unaware if their relatives were alive or dead, “people did not have a firm grasp of what their relatives had been subjected to,” he noted. What’s more, some scholars tend to take it as given that members of elite families stayed elite up into the 1950s, but in actuality, “they were really at the bottom rung of Soviet society and somehow grasped their way back up” to their former positions. Opening the discussion to audience members, Casper asked for comments that would improve the format of his paper and advice for approaching archival materials. He emphasized that he labelled Mikoyan a “patron” in his paper and wondered if this patronage framing succeeded. Tucker was skeptical of the term “patronage,” on the basis of Casper reporting that Mikoyan was motivated by loyalty to individuals who had worked with him in the past, as opposed to the quid pro quo (e.g., votes for goods) that one normally associates with patronage networks. Jane Burbank, Professor of History at NYU, made a similar point, suggesting that Casper think about patronage and protection in a different way. “How much of a two-way street is it?” she asked. “Allocating goods is really what you’re looking at. These are not negotiations, which are equal on both sides.” Tucker also raised the question of exactly what it was the reader was supposed to learn from Casper’s archival materials—mostly letters to Mikoyan in which the writers pleaded for help: “What am I getting out of this historical evidence to convince me that theoretical arguments are correct? How would we falsify your argument on the basis of these letters?” Tucker asked. In response, Casper concurred that the presence of the letters alone does not necessarily mean anything in particular. But, he added, “the ones that actually deal with rehabilitation do fit a certain profile: friendships.” Mikoyan actually bothered to forward these letters and engage with them. “If there wasn’t that factor—that personal attention—I wouldn’t say it was patronage.” What’s more, Casper argued that this patronage network was a connecting fiber. Once you’re “stigmatized, castigated, reviled for social identity, how do you crawl your way back up?” he asked. At least for people at the top, “the kernel that gets these people back in is that this patronage relationship was unresolved. There had not been the reciprocity that Mikoyan owed them in the first place.” While Casper added that he could not quantify guilt or individual culpability through reading these archival documents, “I can say that for some reason, [Mikoyan] found it necessary to take up these peoples’ cases.” To Casper, this can be labelled patronage “by proxy” or “mediated patronage” because those that Mikoyan helped were related to the people who were his actual patrons. Other questions engaged the topic of bureaucracy and the role of institutions other than the state in the process of rehabilitation. One audience member applauded Casper for discovering the role of individuals like Mikoyan, but wondered whether there existed any legal framework and how it might compare to earlier periods. In terms of institutions, Casper mentioned the writer’s union archive, which held the first list of approximately 65 members of the union who had been readmitted in July 1956 after rehabilitation. “It’s not just necessary to rehabilitate [a person], but also his writing,” he explained. In regards to the law, there was an actual legal procedure, Casper said. An individual’s criminal file was taken and read, and after reviewers examined interrogation transcripts and testimony, they determined if the confessions and denunciations made sense. “There was no presumption of innocence,” he added, although often times there was no actual evidence of a crime committed in the first place. Casper added that the difference with rehabilitation at other times was that the “people released were alive.” Mass amnesties from the gulag occurred three times—in 1945, after Stalin’s death in 1953, and 1955. Still, amnesty “doesn’t remove the stain of criminality, […] it just ends your sentence earlier,” Casper said. For those released, full civil rights were never restored. In regards to continuity in the system, “I think what we see is an assertion of a form that is familiar, inherited, but is filled with very different contents and actors,” he said.